Markets marked time yesterday as it waits for the Fed decision tonight. The dollar hardly moved, equities drifted slightly as did bond markets. Gold remains close to $1200. 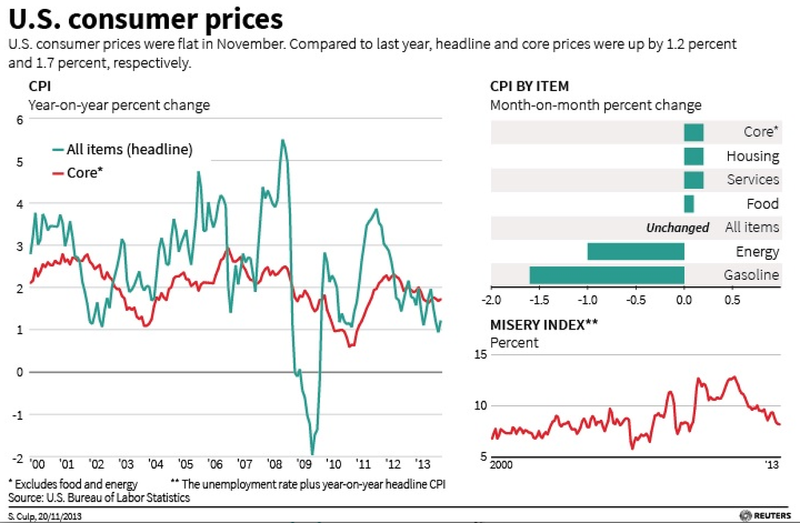 Yesterday's US inflation data was benign at best, taking the pressure of the Fed to move today. Below is a chart of US inflation, (courtesy of Reuters) one can clearly see despite the quantitative easing program there has been no real pickup in Consumer Price Inflation. Looking at the chart one could conclude that the quantitative easing program's main impact has been to prevent deflation in the US. The other event today that may be worth keeping an eye on for an indication of the strength of the US economy, is General Electric's annual meeting for investors and analysts. Analysts have penciled in a 6% increase in earnings for next year at GE. I remember listening to a very positive earnings call in 2004 from GE and it struck me at the time as a bullish sign for equity markets, which indeed it was. Tonight is the last meeting that Ben Bernanke will Chair, I wonder how much he would like to be the man to announce the start of the Fed tapering. It would be a vindication of his policies if he felt the economy was now strong enough to wind down the purchase program. How markets behave tonight is hard to guess, if the Fed does taper are investors prepared enough for the impact to be minimal? Should the Fed not move today will investors now look to January and assume they will move at that meeting. If the Fed do taper today and give clear forward guidance I think this will remove a lot of uncertainty and that is often positive for equities. Most assume that if the Fed to taper the bond purchase program today it will only be a modest move, I imagine the reaction of markets could also depend on the amount of tapering. Posted on December 18, 2013 by Paul Sedgwick.